For the ultimate in high-impact one-on-one marketing, our digital color printing department delivers the goods with full color variable data, duplexed on up to 12" x 18" sheet (with bleed combined). Better yet? Expect to receive quick turnaround on any quantity from 1 to 5,000 pieces. See how fast and affordable full color, mass personalization is for your next printed piece! At Input Technology we use a Xerox Docucolor 6060. The Docucolor 6060 is excellent for digital full color printing of any volume postcards, greeting cards, brochures, business cards, calendars, labels, and even pocket folders. Prints on a wide array of paper and substrates ranging from 18 lb. Bond/45 lb. Text to heavy weights as high as 110 lb. Cover. Color Printing simply sells better. We're created to be color sensitive and, whether it is a brochure, flyer or direct mail, color persuades more effectively than black and white. Color is not just for brochures, in fact, a full-color postcard receives a 35% greater response than a normal one. We also support commercial laser printing in black and white. We can make any direct communication with your customers affordable. Excellent choice for daily, weekly, monthly, and annual statements. Can also be effective in letters, donation requests, and other simpler one-to-one communications. 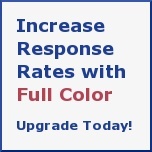 The value on your commercial color printing and black & white printing has never been better. Call Input Technology and ask about upgrading your project to full color.